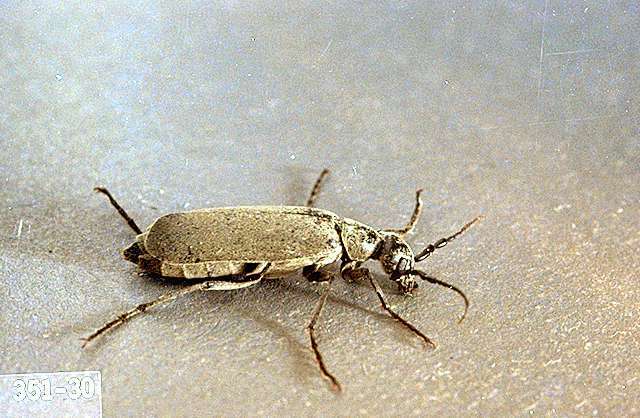 Pest description and crop damage Gray, black, spotted, or striped beetles 0.5 to 1 inch long, with conspicuous necks and soft, rounded wing covers that leave the tip of the abdomen exposed. Larvae are beneficial predators of grasshopper eggs; damaging populations of leaf-feeding adult blister beetles are most likely where sugar beet fields immediately border grasshopper breeding areas. Scouting and thresholds No formal economic thresholds exist for blister beetle insecticide treatment decisions. They seldom are an economic problem. azadirachtin/pyrethrins (Azera) at 0.0125 to 0.025 lb ai/a, and up to 0.044 lb ai/a under extremely heavy infestation. Dilution in a minimum of 30 gal of water per acre is recommended for conventional equipment. May be applied by air at the rate of 0.0125 to 0.025 lb ai/a in a minimum of 25 gal of water. Do not repeat more than every 5 to 7 days. Some formulations are OMRI-listed for organic use.